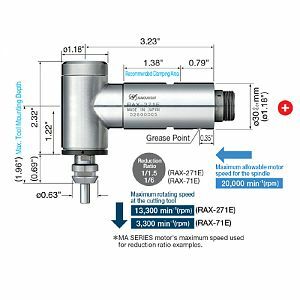 This 90°Angle Spindle is assembled with high precision angular ball bearings 2 each on front and rear sides to obtain high accuracy and strong rigidity and is capable of using up to a ø1/4"(ø6.35 mm) collet chuck. • Weight: 1 lb. 4.46 oz.